How Does Your Savings Account Compare With the Average American’s? How About the Top 1%’s? How does your savings account stack up to the average American’s? How about the top 1 percent’s? As of June 2018, the average U.S. household has $175,510 in savings, including bank and retirement accounts. Compare that to the average household in the top 1 percent, which has close to $2.5 million in savings. …If we look at medians, or the middle values of savings accounts, [however,] these numbers change dramatically. the median American household has only $11,700 in the bank. This means that half of the approximately 126 million U.S. households have more than this, while the other half has less. The median top 1 percent savings account, by comparison, holds just under $1.2 million. It’s clear that too few working-age Americans are preparing for retirement adequately, and many who are retired worry that they won’t be able to maintain the lifestyle they desire. only 32% of retirees—nearly a third—said they felt “very confident” in their ability to live comfortably during their years outside the workforce. Besides not having enough in savings, many Americans aren’t doing enough to grow their wealth. Back when interest rates were close to 20%, thanks to former Federal Reserve Chairman Paul Volcker, yields on certificates of deposit (CDs) were attractive enough that many households favored them over riskier assets such as stocks. Now let’s take a look at the stock market. The S&P 500 Index is up almost 200% from 10 years ago. The compound annual growth rate (CAGR), then, is 11.6%. With dividends reinvested, the CAGR becomes 13.9%. There’s a reason why Albert Einstein allegedly called compound interest the greatest invention in human history. The problem is that too few Americans have participated in this bull market. Of the bottom half of U.S. earners, only about a third own stocks, according to Fed estimates. 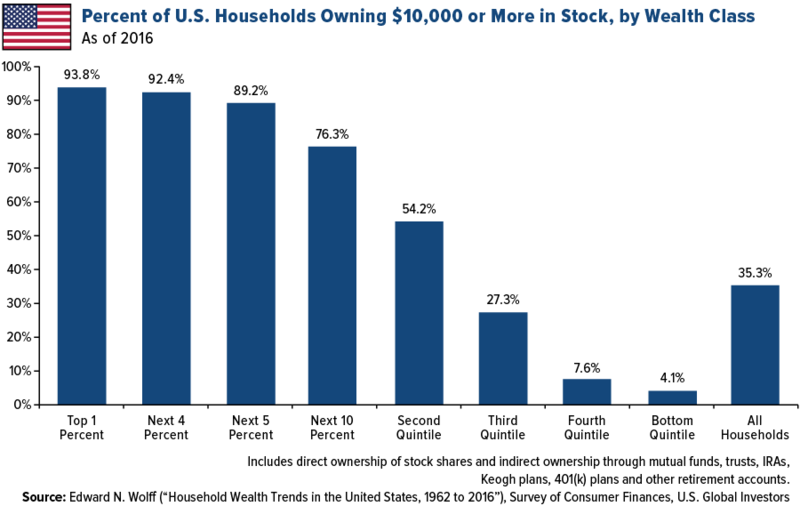 Perhaps not surprisingly, the more a household earns, the more likely it is to invest in the stock market. Take a look at the chart above, based on data produced by American economist Edward Wolff. Less than 5% of the bottom 20% of earners have $10,000 or more invested in the stock market, either directly or indirectly. Only 35% of all American households do. If you ask someone why they’re not invested, chances are they’ll say that it’s too risky but, when you have a long-term view—10 years or more, for instance,—investing in the stock market looks very attractive. Stocks have historically been up for the 10-year period. In fact, the only two times when stocks weren’t up for the 10-year period…were the middle of the Great Depression and in 2008-2009 during the Great Recession.